A Cigar for the Man! This one is in 30-06. 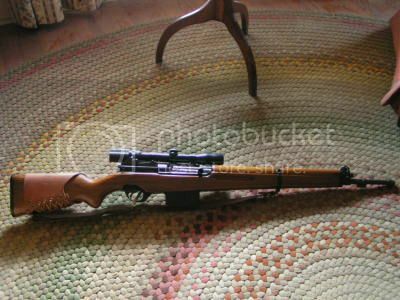 I have quiet a few Rifles that I could post, but they would all be too easy to identify for an American or a Brit. Of course I know everything about it--I'm its namesake of course. That was a good one, but posting your own collection on this kind of thread wont last long unless you have your own museum. Nothing to be ashamed of. Too bad FN came out with that gun about ten years too late. Nothing against the Enfield, but I am sure the Brits could have used it in WW2, and they certainly have an affinity for FN. Another lame attempt at stumping the experts. Yep. A M1819 Hall Breach Loading Rifle designed by John H. Hall. This particular model was converted from flintlock to percussion cap. The main years of production were 1820-1830 at the Harpers Ferry Arsenal. It was the first breach loading rifle of any army to be adopted in large numbers but not the first one to be used by military units. While it was faster to load, and slightly more accurate than the current musket in use it was costly to make and the breach design caused a significant loss in power at longer ranges due to escaping gasses. Thus its was considered a wash and the cost of production made it unrealistic to arm a much larger standing army in the Civil War so most soldier were issued Muskets. The fact that most of the Hall Rifles were 30 years old and worn out also doomed them from more use during the Civil War. That said, The Hall Rifle proved itself in many smaller engagements between 1830 and 1860 in some of the early "Indian Campaigns"
A Colt Root revolver rifle, probably .42 cal.